TAMPA, Fla. — You’ve probably heard the standard advice about keeping your pets safe during the holidays: Don’t let dogs gnaw on turkey bones, make sure cats don’t swallow tinsel. 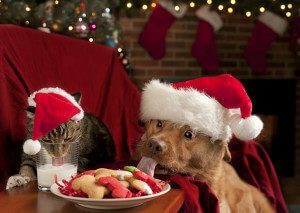 But veterinarians at BluePearl see a slew of other holiday emergencies you may never have considered. Christmas lights. A string of Christmas lights may not sound dangerous, but every year veterinarians treat dogs and cats with electrical burns on their mouths. The reason? Some pets, especially cats and puppies, just love to chew those power cords. A jingle bell toy. Buy a big package of cat toys and you’re likely to get a small plastic ball with jingle bells inside it. When is this dangerous? When your dog decides it’s a delectable treat and swallows it. If you give your dog some fatty human food, vomiting and diarrhea may result. But low-calorie food could hurt dogs even more – and possibly kill them – if it includes the artificial sweetener xylitol. The substance is highly toxic to dogs. It shows up in gum, sugar-free candies and baked goods – even in a few types of specialty peanut butters. Check labels to avoid the danger. The ribbons on your presents. Ribbons can cause big problems when dogs or cats ingest them, especially if they travel all the way into the intestines. Grandma’s purse. Or anyone else’s, especially if they leave it on the floor where your inquisitive pet may stick a nose inside it and wind up eating something dangerous like a bottle of medicine. Dr. John Gicking, a BluePearl veterinarian who is board-certified in emergency and critical care, summarized the dangers of the holidays as “food, stuff and the environment.” Chocolate can be toxic to dogs, and so can raisins, grapes and onions. Anything resembling string could wind up in a cat’s stomach. Like all BluePearl specialists, Gicking has years of extra study and advanced training within his discipline. He said he sees a lot of the same incidents every holiday season, such as cats injured by knocking over the Christmas tree. Broken ornaments can cut dogs, cats and even the occasional human. In addition, the hustle-bustle of holiday gatherings means pets sometimes slip outside when they’re not supposed to. BluePearl hospitals provide 24/7 emergency medical care for pets – including holidays – in most locations. For more information, or to find the BluePearl hospital near you, visit bluepearlvet.com.